Happy Day before the Fourth of July! I hope everyone has a fabulous holiday! 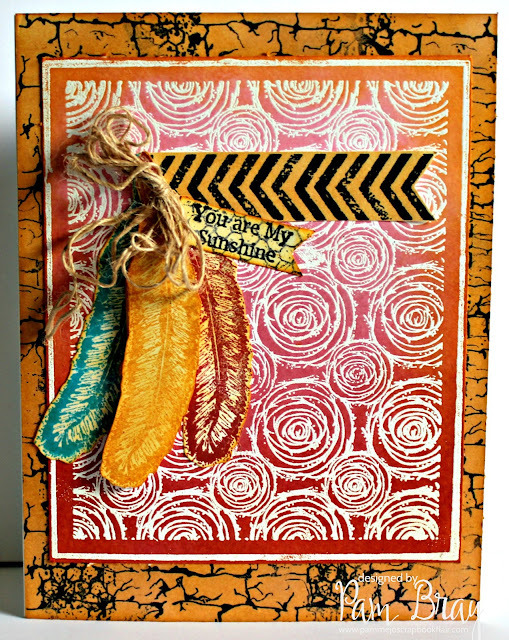 I am enjoying my holiday playing in the studio with Sin City Stamps! Today I am sharing with you an ombre technique along with using my latest stamps from Sin City Stamps! on white paper using embossing ink and applying white embossing powder. Go over the top 2/3 of the prepared piece with Victorian Velvet. Do the top 1/3 with Worn Lipstick. Trim excess paper away from inked background piece. Stamp a couple of the images from the Grunge Stamp Set on to white paper with black ink. Ink the top of the grunge background with Tea Dye and Wild Honey. Ink the edges of the prepared Rose background with Wild Honey. Adhere together to form top to card front. Salty Ocean, Fired Brick, and Wild Honey. Stamp background from the Grunge Stamp Set on to white card stock with black ink. Stamp sentiment from the Memories Art Set on to prepared piece with black ink. Apply Wild Honey to top of prepared sentiment. Fussy cut out to form small flag. Stamp background from the Grunge Stamp Set add to front of card front along with sentiment. Add fussy cut feathers to the top of card front; placing one on with pop dots. Add small tan twine to feathers.